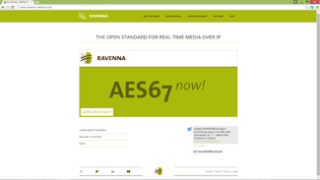 ALC NetworX, developers of the Ravenna audio-over-IP technology, have launched a new website dedicated to Ravenna and AES67 at http://ravenna-network.com. The new website retains Ravenna’s trademark green identity while using modern web development techniques to deliver a new look and feel with dynamic content. Visitors to the site will find product listings of Ravenna-enabled products, video content, access to a renewed YouTube channel, a Solutions area for manufacturers, and more. The site also features a section dedicated to the AES67 interoperability standard published by the AES in 2013 and how it relates to digital audio networking in general and to Ravenna in particular. As part of the working committee that developed the AES67 standard, and in light of the fact that Ravenna is currently the only AoIP technology that is natively AES67-compatible, the new website offers comprehensive resources available for those looking for information on how to implement AES67 into their installations.